Christine Dwyer stars as Jenna in the touring production of Waitress, which runs through Dec. 16 at the First Interstate Center for the Arts. 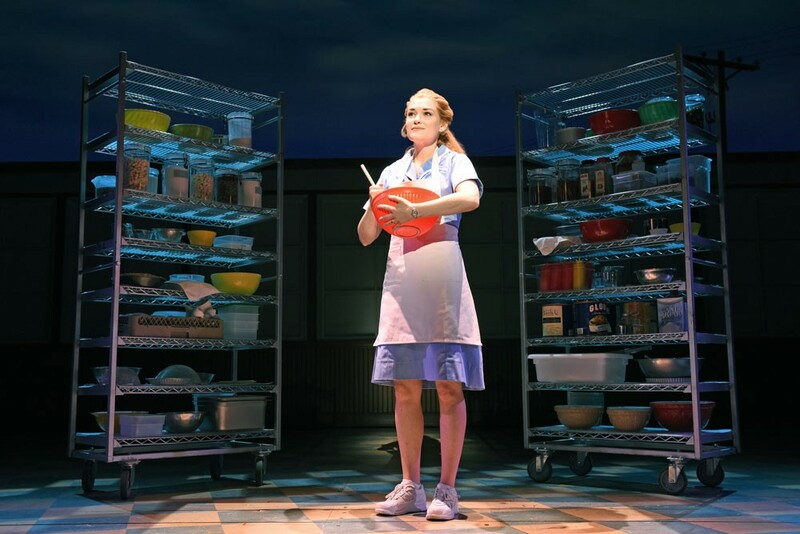 In the world of Waitress, a warm slice of pie can solve a lot of problems. Not every problem, mind you, but in the right place and at the right time, it can prove transcendent, if only for a moment. The Tony-nominated musical, which opened last night at the First Interstate Center for the Arts, serves a similar function. It's a mostly sunny confection, as light as a good merengue, that's still grounded enough to realize that its characters can't simply fold all their hardships into a crust and bake them away. Based on the late Adrienne Shelly's 2007 film, Waitress is the story of Jenna (Christine Dwyer), who's stuck in a sleepy Southern town with her deadbeat, abusive husband Earl (Matt DeAngelis). She finds a modicum of freedom in the roadside diner where she works, whipping up daily pie recipes that are, judging by the reactions of the people eating them, otherworldly. Jenna's only confidants are her two co-workers — the brassy Becky (Maiesha McQueen) and the geeky, lovelorn Dawn (Jessie Shelton) — and they encourage her baking talents. They also want to know when she's finally going to pack up and leave Earl in the dust. But then there's a hiccup: Jenna discovers she's pregnant — "I do stupid things when I'm drunk," she explains, "like sleep with my husband" — and when she heads into the doctor's office, she finds that her OB/GYN has retired and been replaced with the handsome Jim Pomatter (Steven Good). He recently relocated from Connecticut with his wife, and although he means well, he's such a clueless, clumsy doofus that somebody should probably double-check his medical credentials. They fall for each other almost instantly — well, after Pomatter consumes the love potion that is Jenna's Marshmallow Mermaid Pie — and begin a tryst that essentially turns Waitress into a comedy about a doctor repeatedly violating the Hippocratic oath. Inspired anew by their extramarital relationship, Jenna keeps retreating into her fantasies and imagining new pies, one of which she'll no doubt take to the upcoming pie-making contest with the $20,000 grand prize that'll finance the next act of her life. Jessie Nelson's book significantly amps up the goofiness, giving the supporting characters plenty of opportunities to ham it up. Jeremy Morse is a scene-stealer as Dawn's over-eager, poetry-reciting suitor Ogie, whose "Never Ever Getting Rid of Me" number is one of those breathless comic set pieces designed to immediately win over an audience. Diner manager Cal (Ryan G. Dunkin), Pomatter's nosy nurse (Rheaume Crenshaw) and wily diner owner Joe (Broadway veteran Larry Marshall) also get big punchlines. McQueen and Shelton, who both have voices as big as their personalities, are terrific as Jenna's BFFs, sassy and sunny in equal measure. To follow one of the show's central metaphors, it's Dwyer's performance that really makes all these disparate flavors gel, the flour that holds it all together. Even if some of the script's beats are manufactured, she projects a warmth that doesn't feel forced; we're with her every step of the way, even if the plot isn't. Her standout number, the tricky ballad "She Used to Be Mine," is delivered to both Jenna's unborn baby and the woman she once was, and it's easily the show's most powerful moment. As was the case with the film that inspired it, Waitress eventually wins us over with its sheer exuberance and goodwill, and its final confrontation between Jenna and Earl — which had the opening night audience whooping and hollering — is empowering: This is, when you boil it down, a tale of three women supporting each other, and learning that the recipe for happiness sometimes contains ingredients you wouldn't expect to taste so good together. Waitress continues through Dec. 16; tickets are available here.